We are looking for EVS volunteers for 2 different projects. The deadline for applications is 30 November 2018. Any applications sent after the deadline will not be taken into consideration. The projects will run from end of February 2019 – February 2020. Both projects are in Reykjavík area. AUS – ICYE Iceland is a coordinating organization for those projects. To apply, please send us your CV and a Letter of Motivation to evs@aus.is, mentioning the name of the project you’re applying for in the subject of your email! The volunteer must be open highly motivated to spend a year living in a country like Iceland, minded, flexible, enthusiastic, responsible and able to take on various tasks and initiatives. He should be willing to learn and have good communication skills as human interaction is very important in these projects, as well as interested in working with the elderly or people with disabilities. No specific educational background is required. 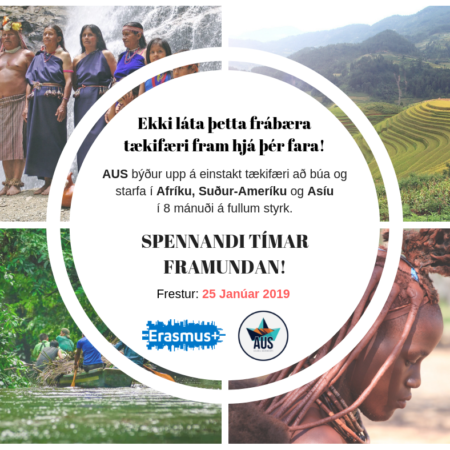 Local transportation expenses, health insurance, language courses, travel expenses (according to distance from volunteer’s country to Iceland) and on – arrival training are also covered, as part of Erasmus+ programme. 2 days of holidays per month will be given. Holidays will also be given during Christmas, Easter and other holidays in accordance with Icelandic laws and customs. 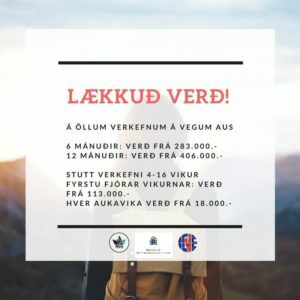 The Icelandic Red Cross runs 3 shelters for people with mental disabilities: Vin (Reykjavík), Dvöl (Kópavogur), Lækur (Hafnarfjörður) and Laut (Akureyri). The aim of the day centers is to socially integrate otherwise isolated people struggling with mental illnesses, to help them change their routines and add something extra to their lives, thus strengthening their physiological, physical and sociological well-being and improving their quality of life. Furthermore, the aim is to help the guests to improve/develop various skills through participation in daily activities. VIN offers these people the possibility to have something interesting to do during the day, like playing chess, playing boccia, doing gymnastics or dancing (sometimes), listening to music, painting, writing or watching movies when they want. Concerning practical facilities, they can have something to eat in the morning, and there is a main meal at lunchtime for those who want to join. They can also use the shower, the washing machine, and rest a bit in a room with a few mattresses. Some of the clients stay a long time during the day, others just for a while, others for the main meal, and others for specific activities. Most of the clients are autonomous, but for those who are not, help and support is offered upon request. VIN is meant for those who have been hospitalized in the past but who don’t need further special care (there is no medical care at VIN project). At VIN, the volunteer’s tasks will be to assist the staff in the shelters taking care of the mentally ill. He/she will be asked to be the extra staff that otherwise would not be hired, a helping hand and a caring friend. It is important to have in mind that the volunteer will be working with sometimes fragile people, people who suffer from a mental illness but do not need to be hospitalized. The volunteer will participate in different activities, such as conversing with the guests and spending quality time with them, cooking (about two hours preparation), organizing and participating in the activities of the day, etc. The volunteer will also be asked to join the staff in some extra activities, like going for a walk or visiting a museum (occasionally). In this project the volunteer’s ideas, skills, and initiatives will be welcomed. Every worker and the volunteer will participate in everything. There aren’t specific tasks for each worker and all of them work together in a friendly atmosphere. Once a week, the volunteer will cook lunch together with one of the guests for about 18 people. The task of the volunteer includes encouraging the guests to participate actively in making decisions such as what to cook and buy, in preparing meals, and tidying up in the kitchen and the dining room. Schedule: Working hours will be from 9:00 to 16:00, five days a week, weekends off. Accommodation: The volunteer will live in a flat in Reykjavík with other EVS volunteers and will have a private room. Food: The volunteer will have breakfast and lunch in the project, and get in addition to that food money for the meals not covered by the project. Allowance: The volunteer will get a certain amount of pocket money, every month. 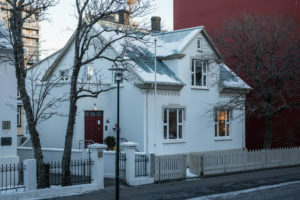 Grund is the oldest home for the elderly in Iceland. In October 2012 it was celebrating its ninetieth anniversary. Grund is a private foundation. Today it hosts 200 residents and has more than 300 employees. It is divided into four parts: first of all there is the main building overlooking the Hringbraut street, in the North there are Little Grund and Mini Grund, and the last part are a couple of apartments on Brávallagötu street – folks staying there are in better shape, but still can enjoy the day watch services. When the Morgunstund is finished the volunteers and other staff members will assist the elderly back onto their ward before taking a group for a walk. One of the main focuses in Grund is to support the elderly in staying fit and healthy and daily walks are very important tool in doing so. The volunteers will choose the route depending on weather and the group in question. During the walks the volunteers interacts with the elderly and by doing so can enrich the life of the elderly and hopefully their own. After lunch the volunteers will spend one week in occupational therapy and the other in physiotherapy working with the elderly. In the occupational therapy unit, the volunteer can assist the elderly in their leisure work such as knitting, needlework, making candles, beading and other handicrafts. This time is no less about spending time and socializing with the elderly as it is about assisting them. In the physiotherapy the volunteer assists the trainers with various tasks such as with exercise routine, weights, playing boccia and swimming. The volunteers will be trained and supported while working in the physiotherapy unit. There is also the possibility to work within the parish, Independent Church, as the parish priest is the contact person within Grund. He will then discuss this option with the volunteers and units the volunteers will be assigned to at the time. Possibilities with in the Independent Church are for example to cook for people attending courses (maybe a national dish), to attend confirmation seminar and camp which is held in the countryside, to assist in the Sunday service where the largest population is the elderly, to help organize social events such as trips and recreational and sports encounters, and supervision at the parish’s library and cultural resource center. Working hours: Usually between 9:00 – 11:30 and 13:00 – 15:30, Monday to Friday, but may vary. Weekends are free. Volunteers will work a maximum of 36 hours/week.